Is BMI greater then 60 a predictor of higher morbidity after a laparoscopic Roux en Y gastric bypass? It has been hypothesized that patients who are super-super morbidly obese, defined as having a Body Mass Index (BMI) of 60 or higher, have an increased rate of post-operative complications. As surgical techniques and operator experience with Roux en Y gastric bypass improved with time, the selection criteria have expanded to include the super-super morbidly obese. We hypothesize that a higher BMI does not predict a higher postoperative complication rate. The prospectively collected database for our Accredited Bariatric Program was queried for all laparoscopic Roux en Y gastric bypass procedures performed between January 2004 and July 2006. All cases were performed by a single surgeon at a tertiary care center. Average post-operative follow-up time was one year. Patients were stratified into two groups: BMI < 60 and BMI >= 60. The number of post-operative complications was compared between the two groups using a Chi-square method with Yates correction. One hundred and sixty nine patients with adequate follow-up data were identified during the study period. Of these, 148 patients had a BMI < 60 (Group 1) and 21 had a BMI >= 60 (Group 2). There were 28(19%) total complications in Group 1 and 4 (19%) total complications in Group 2. There was no statistical difference between the two groups (P value=0.98). Stricture rate was 10% in Group 1 and 5% in Group 2. Patients with a BMI >= 60 do not have a higher post-operative morbidity compared to other patients undergoing laparoscopic Roux en Y gastric bypass. The stricture rate is less in patients with a BMI >= 60 compared to other patients. Longer follow up is required to detect complications that occur after one year. 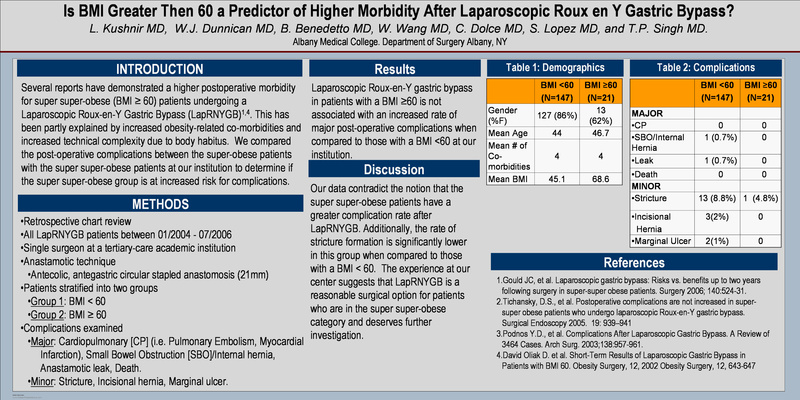 Our study shows that laparoscopic Roux en Y gastric bypass can be safely performed on the super-super morbidly obese.